Trampolining is a fun way for children or adults to get regular exercise and has great long term fitness benefits. Children never seem to tire of playing on them, and many adults see it as a fun way to get some exercise and have begun using them themselves. Before buying a trampoline there are some things you should look out for to make sure you buy the right kind of trampoline to match your needs. Trampolines are fun, but there are some safety issues and guidelines you should be aware of before using one. The points covered here should help you decide on the choice of trampoline and the safety aspects you need to be aware of when using the equipment. Look for a trampoline that is going to cover all your requirements. There are weight and age guidelines available for most models of trampoline make sure the one you buy meets your needs. Always buy a trampoline that has spare parts readily available for replacement. Is it just the children that are going to use it? Most adults or teenagers can't resist having a quick bounce, so make sure the one you buy will take their weight safely. Round trampolines are the most popular for general family fun. They come in various sizes with 12 ft -14 ft being the usual sizes. 10 ft trampolines are also available if you are restricted by space in your garden. Round trampolines generally have a slower less powerful bounce than rectangular models and are more easily controlled and are safer because of this. 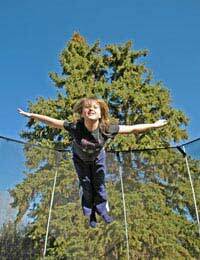 Children's rectangular trampolines have less bounce than larger trampolines because they have smaller springs and the frames are lighter. They are ideal for children aged 7-11, but are not suitable for adults or teenagers. Heavyweight trampolines can usually be used by anyone and are a rigid version of the folding types that most schools or sports centres' use. Is your trampoline going to be used as a serious piece of sporting equipment, or is it just going to be a plaything for all your children to play on? The cost difference in the various quality of trampolines is considerable, so make sure you purchase one that you will cover all your requirements, without paying a fortune for one that is too large or to high a spec. Choose a rectangular trampoline if you want quality performance and bounce. Rectangular trampoline springs work at different rates to give a more powerful lift and a quicker response. You should only allow one person at a time on a trampoline, especially rectangular ones. Don't let anyone attempt somersaults unless they are extremely proficient in the use of trampolines. Landing on the neck or the head can cause serious injury. The trampoline should be placed well away from trees, play areas and other structures. Use a trampoline enclosure. This is a net that goes round most of the area of the trampoline and prevents users falling off the trampoline onto the ground. Children who use a trampoline should be supervised at all times. Have impact absorbing safety surface material surrounding the trampoline. Check the trampoline regularly for tears or wear and damage to springs. Make sure users jump in the centre of the trampoline. Be safe not sorry. Use your common sense and good judgement when using the equipment safety is of paramount importance when using a trampoline. If used properly a trampoline is great recreation and excellent fun for people of all ages.